The Seattle Cheese Festival kicked off Friday afternoon with a few cooking classes taught by local chefs. Although all three classes sounded interesting I knew immediately which one I was most interested in taking. If you have ever been to The Harvest Vine, the tapas bar in Madison Valley, you’ll know exactly why and if you haven’t been there it’s high time you checked them out. At The Harvest Vine, Chef Joseba Jimémez de Jimémez works magic in a tiny kitchen as he brings the tastes of his hometown of San Sebastian, Spain to this Seattle neighborhood. 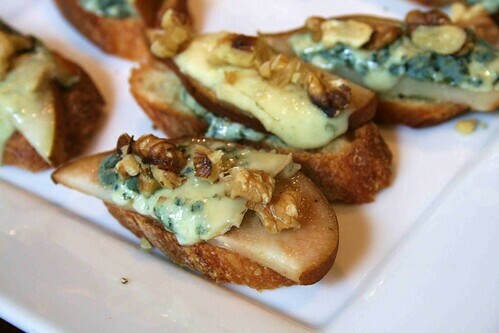 The menu is comprised of tapas, the small plates of Spain. 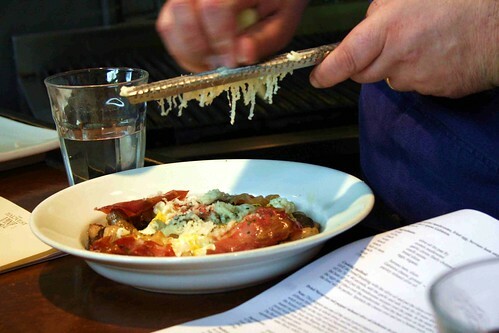 He brings in many authentic ingredients to create these beautiful, tasty, creative morsels. And because the plates are small, any dining interlude here can encompass a multitude of experiences. There’s also a great wine, sherry and port menu to check out. I am particularly fond of small bites in general but especially those of Spain so I was very excited to have the opportunity to learn from Chef. Friday at noon found ten of us lining up along the copper-topped bar that surrounds the tiny kitchen. As seems to always be the case, I sat between two very nice women, one who works at the cheese counter for Metropolitan Market and the other a photo editor for Microsoft. Foodies are a very diverse group of people! Chef started the class with background information about the Cheese Festival, his background and the Basque region and then we got down to the demonstration and sampling! The first dish featured beautiful, fat white asparagus that, unfortunately, are shipped in from a grower especially for the restaurant so not available to us. 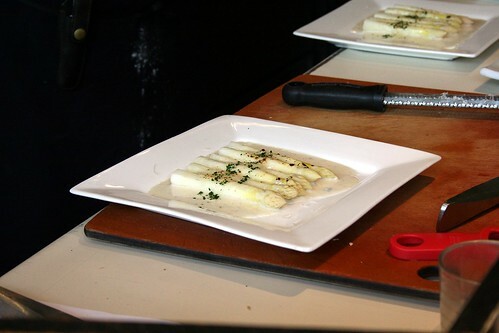 However the dish can be prepared with the smaller white asparagus that are available locally or even a green version. The simplicity of this recipe, as well as the others, is part of the appeal of these dishes. Basically the asparagus were topped with a flavorful béchamel sauce and then a little grated agour cheese, a sheep’s milk cheese. 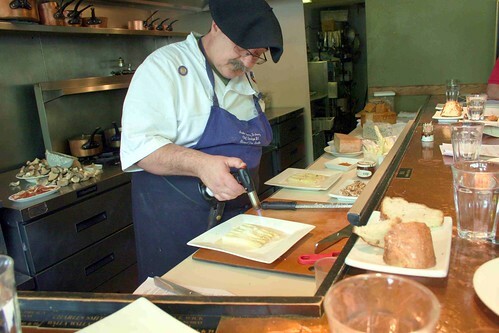 Chef used a kitchen torch to melt and lightly brown the cheese before serving. Next up was a dish I wanted to rush home and replicate! I could see making this for breakfast, lunch or dinner! The only thing that might change would be what you served along with it. 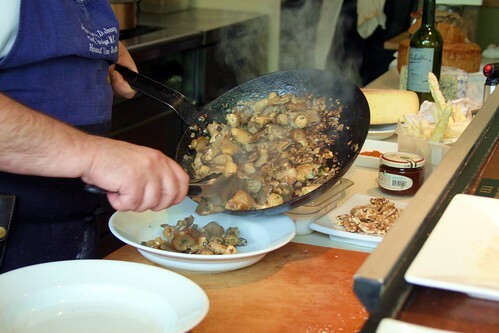 The dish started with sautéed oyster mushrooms (including garlic and onions). Chef started out with the mushrooms on the plate but the recipe suggests starting with toast made from a nice country bread. I think you can’t go wrong either way. The next layer consisted of eggs fried until the whites were just set but the yolks still golden yellow liquid. 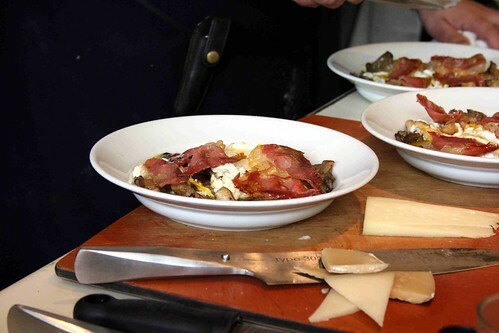 Those were topped with a few slices of Serrano ham, quickly fried in the same pan and then the whole dish was topped with grated Gabietou cheese. All of these little plates brought together amazing flavors and textures yet were fairly simply prepared allowing the wonderful ingredients to really shine. 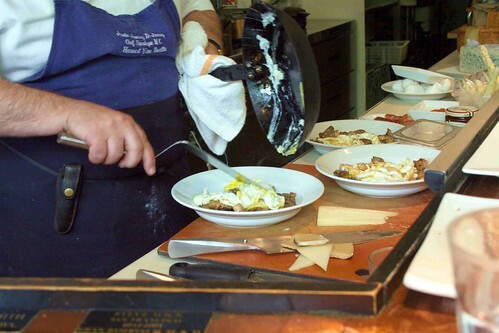 Chef offers other classes and wine dinners from time to time so you may be able to experience the magic on your own. And, of course, you can always drop in for dinner and try a few things out. Sitting at the kitchen bar is a great experience – even when there isn’t a class in progress. And, good news! A new location is being planned to open in late summer in the Belltown area – at least if the permitting process allows. This new location will feature pintxo options and will have a standing bar such as the traditional locations in San Sebastian. Located at 2nd and Blanchard it will become part of a new dining trifecta including Zoe, the "old" star of that corner, and Tavolata another newcomer about 1/2 way down the block. With those three options that will be a corner I’ll be strolling often. A few more photos from the class and from a previous meal there can be found here.